A recent finding by medical geneticists sheds new light on how facioscapulohumeral muscular dystrophy develops and how it might be treated. More commonly known as FSHD, the devastating disease affects both men and women. FSHD is usually an inherited genetic disorder, yet sometimes appears spontaneously via new mutations in individuals with no family history of the condition. 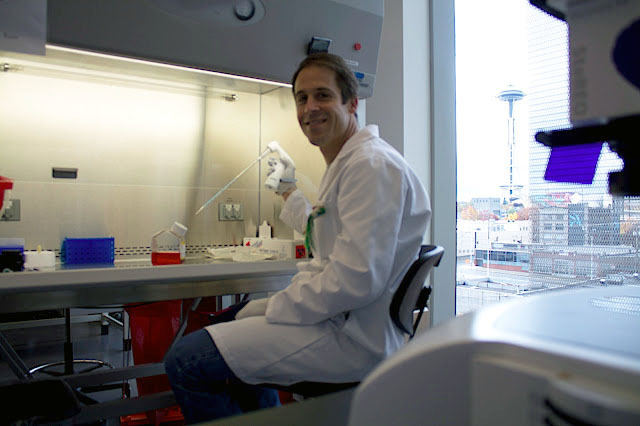 Dr. Daniel Miller studies the molecular basis of muscle disorders in his lab at UW Medicine South Lake Union. 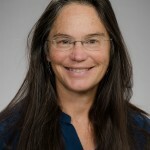 “People with the condition experience progressive muscle weakness and about 1 in 5 require wheelchair assistance by age 40,” said Dr. Daniel G. Miller, University of Washington associate professor of pediatrics in the Division of Genetic Medicine. Miller and his worldwide collaborators study the molecular events leading to symptoms of FSHD in the hopes of designing therapies to prevent the emergence of symptoms or reduce their severity. In the Nov. 11 online issue of Nature Genetics, Miller and Dr. Silvere M. van der Maarel of Leiden University in The Netherlands, along with an international team, report their latest findings on the role of epigenetic modifications in causing the disease. In Seattle, Dr. Stephen Tapscott of the Fred Hutchinson Cancer Research Center was also a major contributor to the project. He is a UW professor of neurology and a researcher at the UW Center for Human Development and Disability. Epigenetics refers to mechanisms that influence how the genome is regulated and how, where and when genes act — all without altering the underlying DNA sequence. The flexibility of DNA packaging – its wrapping, which can be tightened and loosened, and its chemical tags – is one of the epigenetic forces on the genome. This packaging is called the chromatin structure and is one way specialized cells such as those in our muscles allow groups of genes to be shut off, or be available for expression. Patients with FSHD, usually have a deletion of genetic material that reduces the number of copies of a repeated DNA sequence arrayed on chromosome 4. The deletion alters the chromatin structure of the region and allows the muscle-toxic DUX4 genes within each repeat to be inappropriately activated. Scientists have previously shown that the genetic deletions in FSHD somehow caused an epigenetic change – an alteration in one of the mechanisms that control a gene’s activity. The relaxation of the tightly wound chromatin structure allowed the otherwise sealed code in the gene to be read and the toxic DUX4 to be produced in skeletal muscle. Five percent of FSHD-affected individuals have array lengths, longer than 10 copies (the threshold for chromatin relaxation) of the DNA sequence in question making them appear to lack the genetic mutation that normally causes FSHD. However, these unusual individuals lacked repression of DUX4 code-reading in their skeletal muscle cells because of a mechanism other than copy number. “Breakthroughs in scientific discovery are often achieved by studying individuals with unusual disease presentations,” Miller said. The researchers identified individuals without the usual FSHD-disease causing DNA deletion but who still lacked repression of the DUX4 code reading. Dr. Rabi Tawil at the University of Rochester made the clinical diagnosis in these people and established cultures of muscle cells from biopsies. Dr. Richard Lemmers working in van der Maarel’s laboratory demonstrated that the chromatin structure was relaxed despite a normal number of repeat units on chromosome 4. With the help of Dr. Michael Bamshad, UW professor of pediatrics, and Dr. Deborah Nickerson, UW professor of genome sciences, Miller and his group sequenced and analyzed the protein coding portions of the genomes of individuals with FSHD caused by this uncommon mechanism. The researchers discovered that these individuals had causative mutations in the Structural Maintenance of Chromosomes Hinge Domain 1 gene. Mutations in this gene cause decreased levels of the SMCHD1 protein and result in relaxation of the chromatin structure surrounding the muscle cells’ DNA allowing toxic DUX4 to be generated. “The discovery linking mutations in the SMCHD1 gene with FSHD is particularly satisfying,” Miller said, ‘because the normal form of SMCHD1 has an established role in repressing the reading of portions of the DNA code. SMCHD1 Is involved in silencing one of the two X chromosomes in females and in turning off repetitive elements in other parts of the genome. This work was supported by grants from the NIH (NINDS P01NS069539; CTSA UL1RR024160; NIAMS R01AR045203; NHGRI HG005608 and HG006493), NGI Horizon Valorization Project Grant (Nr 93515504), The University of Washington Center for Mendelian Genomics (1U54HG006493), the MDA (217596), the Geraldi Norton and Eklund family foundation, the FSH Society, The Friends of FSH Research, EU FP7 framework program agreements 223026 (NMD-chip) and 223143 (TechGene), and the Stichting FSHD.